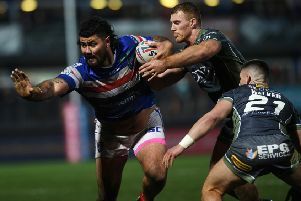 Chris Chester has announced his 19-man squad ahead of Wakefield Trinity’s Betfred Super League round six match against Widnes Vikings on Saturday. Mason Caton-Brown replaces Keegan Hirst in the only change to the squad that lost at Wigan Warriors last week. Saturday’s game at the Mobile Rocket Stadium kicks-off at 6.30pm. Trinity squad: Tinirau Arona, Matty Ashurst, Mason Caton-Brown, Anthony England, David Fifita, Liam Finn, Scott Grix, Ryan Hampshire, Justin Horo, Craig Huby, Tom Johnstone, Ben Jones-Bishop, Danny Kirmond, Reece Lyne, Jacob Miller, Pauli Pauli, Tyler Randell, Bill Tupou, Kyle Wood.